This is a pasta salad that everyone who has ever eaten it has loved! Even those people who never eat vegetables. I guarantee you won’t be disappointed! – 1 cup dry elbow or shell pasta (preferably whole wheat so it holds a little firmness with the salad dressing. *You’ll notice there are no measurements for vegetables. You can use however much your heart desires! I usually use about 1 pint of tomatoes, 1 small onion, 1 crown of broccoli, 1 large cucumber, and 1 of each type of pepper. Feel free to add any other vegetables that you enjoy. Prepare the pasta. A quick and energy-efficient way to do this is to place a pot of water on the stove with a lid and turn on high heat. Once the water is boiling, remove the lid, add the pasta, stir once, replace the lid, and turn off the heat. Let sit for 7-10 minutes. In a large bowl combine the vegetables and pasta and mix well. Add about 1/4 to 1/3 of the salad dressing bottle and mix well. Add about 1/2 to 3/4 cup of feta cheese and stir well. Refrigerate for at least 4 hours before serving for the best flavor. This is a super easy recipe I made for the 4th of July. I didn’t take a picture, but it looks a lot like the picture below from this website . -1 ring of angel food cake (purchased or prepared on your own). Prepare the vanilla pudding and let set in the refrigerator. 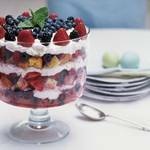 In a large bowl, mix the angel food cake and berries. Begin layering by placing a layer of fruit-cake mixture on the bottom of the dish. Top with dollops of pudding and cool whip. Repeat this layering until you reach the top of the dish. *If you don’t have a tall dish, you can use a long cake pan and just have fewer layers.